« What’s with all the ducks? I managed to duck down to Dunsborough and Yallingup this weekend to chill out and capture some photos. I must admit it was a pretty heartbreaking weekend as Friday evening was the only time I really managed to get a few shots. I was totally rained out Saturday morning and Saturday evening and Sunday morning when I woke up I heard the rain just hammering down on the roof so I did what a normal person would do and went back to sleep and woke up at a decent hour! This is probably one of my more favourite seascape photographs I just love the way the heavy cloud is hanging above the water, its so threatening and yes it did rain shortly after the photo. Has everyone else had enough of this rain? It seems this year we’ve had stacks of it but I read today that we are still under average! This weekend I’m spending in Perth and hitting some local streams to see what they are like. Does anyone else have anything special lined up? 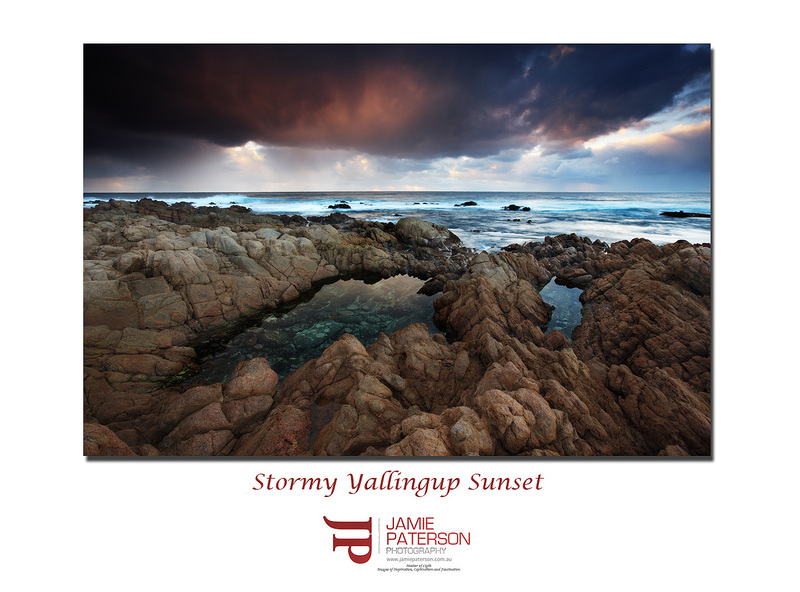 This entry was posted in Australian Landscapes, Australian Seascapes, Sunset Photos and tagged australia, beach, canon, dunsborough, image, Jamie Paterson, landscape, long exposure, margaret river, ocean, photography, reflections, seascape, south west, sunset, water, western australia, yallingup. That’s just in front of the first car park isn’t Jamie? Looks rather calm considering the weather. Personally I’m a winter person and the rain doesn’t bother me a bit, I love it. After all it doesn’t rain every day, it just seems like it. Thanks for commenting. It most certainly is right in front of the car park. I didn’t want to stray too far from the car in case it poured down on me! I know we need rain but give me Rottnest on a summers day any day. As always thanks for stopping by and commenting. Yeah I liked the rock pools. Do you like the way I made the EXIF data easier to spot? 😉 hehe. I loved your last post. That flower bud was really cool. One of my favourites of yours, mate. The colours are spectacular – the reds and blues in the sky, and that aqua in the rockpool! Great composition, crisp details, spot on. Appreciate you taking the time to comment. Okay now I’m getting pretty excited about this image. I’m glad you liked it, not bad for a quick run out of the car inbetween showers. LoL. Thank you! I’m glad people are calling this photo a favourite. Thanks for the comment! I was out past York two weekends ago and saw that the Canola was starting to blossom. I can’t wait to its out in full force, if it isn’t already. Gerat dramatic cloudscape, like it very much! If you got really close to the 2 pools, would it perhaps have been possible to get reflections of the clouds in the water? Thanks for stopping by. I totally agree I’d love to have captured the clouds in the water reflections, and I think I could’ve done it but I was more focused on the rain bearing clouds. Next time I will put more focus into capturing the reflections. Really nice Jamie. There’s a lot going on in the sky. Shame about the rest of the weekend though. Atleast you came away with this ripper. Yeah I came away from the weekend quite disappointed until I saw this photo at home, then I had a big smile on my face. Have you got any great photos lined up for your blog? gota love those rockpools there! At least you came away with something! Very nice shot Jamie – lots of colours and drama in the scene. Hmm, are you still getting the random noise in the sky, is that fixed yet. Seems like its still there, though I had to really squint. This is a great photo, but I’m going to challenge you here, try and enhance the part of the image you want to be the focal point. For me all the focal points have the same brightness, so my eye starts to roam. Squint and look at it again, do you see anything you’d like to enhance if so try dodging and burning and see if that helps. I just came to your site from Chloe’s, and I find your work breath-taking. Your pictures look like paintings! It’s obvious that you are not new to photography. Thank you so much for your kind words. I love hearing that my photography moves people occasionaly. Stay tuned for more! Thanks for that. Its now one of my favourite photos. Beautiful spot and the image to match.